Sources for the Jewish Agricultural Colonies, adjacent towns and villages, located at various times in Southern Ukraine, Bessarabia, Podolia and the Crimea, are relatively hard to find. This site gathers data about the individual settlements, the points of origin of these settlers and recounts their stories. Were there eignteen or seventeen colonies? 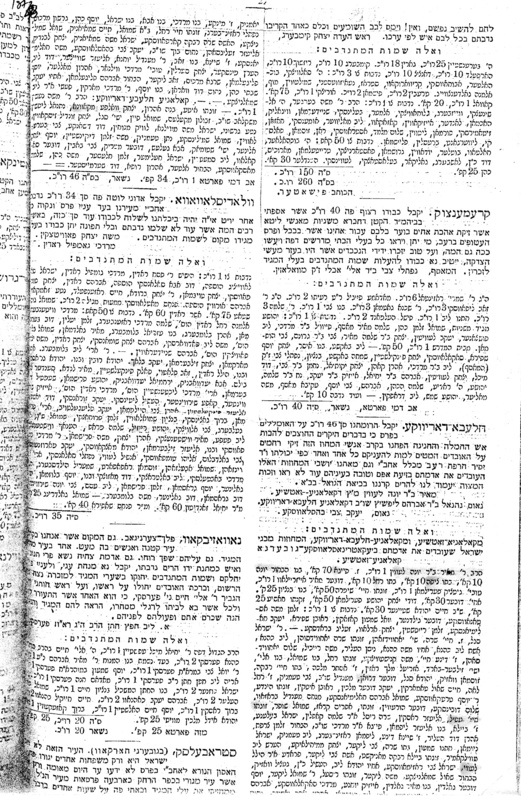 Lecture by Chaim Freedman on the Jewish Agricultural Colonies in the Ukraine presented November 30, 1917, to the Petah Tikvah branch of the Israel Genealogical Society, based on his lectures to the International Conference on Jewish Genealogy help in Jerusalem in 1984 and 1904. on Introduction page. Linked Netchayevka chapter of Jewish Faner's Yizkor book to Netchayevka colony page. To mark the 100th anniversary of the arrival in Australia on December 8th, 1913 of Tessie Freedman (Chaim's mother) with her parents Zalman and Chana-Reizel Komesaroff, the following material has been added to the site. 1830-1897. Biography of the rabbi of Grafskoy. William Comisarow's Memoirs details of life on the colonies. A merge of maps and satellite photos to identify the structures in Grafskoy. Mariupol Pogrom 1905, by Leo Yarutsky. Mariupol pogrom 1905 list of victims. Translation of the Foreword to Uleynikov's book. "Life on the Jewish Agricultural colonies  success or failure"
Opinions on the validity of the conclusions of Uleynikov and Kankrin. Example for the Komisaruk family of Grafskoy. Photographs from the St. Petersburg Film archive and World ORT Photographic archive taken of many colonies in 1904 and 1922 showing public buildings such as schools, synagogues, municipal offices, and farmhouses. "Nayzlatopler Rayon" [Novozlatopol Region] an account of the Sovietized colonies after the Revolution and Civil War. "Destruction of Jewish Tradition under the Soviet Administration"
An article assessing the affect of Sovietization on the destruction of Jewish cultural and religious life with particular reference to the role of the Yevsekzia. Revision lists from colonies Zelenopole and Mezhirech, 1850 and 1858. Memoirs of Grafskoy 1907-1921by the son of a rabbi of the colony include description of life on the colony and the reaction to the pogroms during the Russian Civil War which took place after the Revolution. Prenumeranten Lists [The list of subscribers] from two books published in 1911 which include many residents of the colonies. Original of the book in Google. Links  a new page with links to useful sites. Photos of Ekaterinoslav colony synagogues, schools, administrative offices and general scenes from St.Petersberg Central State Archive of cinema, photo and phono documents (1904). 27 Sep 2008. Grafskoy revision list 1858. 8 Aug 2006. An article aboutcantonists onhttp://www.jewish-history.com web site. History of Lvovo by Albert Kaganovitch was added to the Lvovo page. Jewish agricultural colonies site in russian, created by Yakov Pasik. 30 Aug 2005. People who moved from Kovno Gubernia to Grafskoy (1850-1852). All pages scanned. 8 Aug 2005. 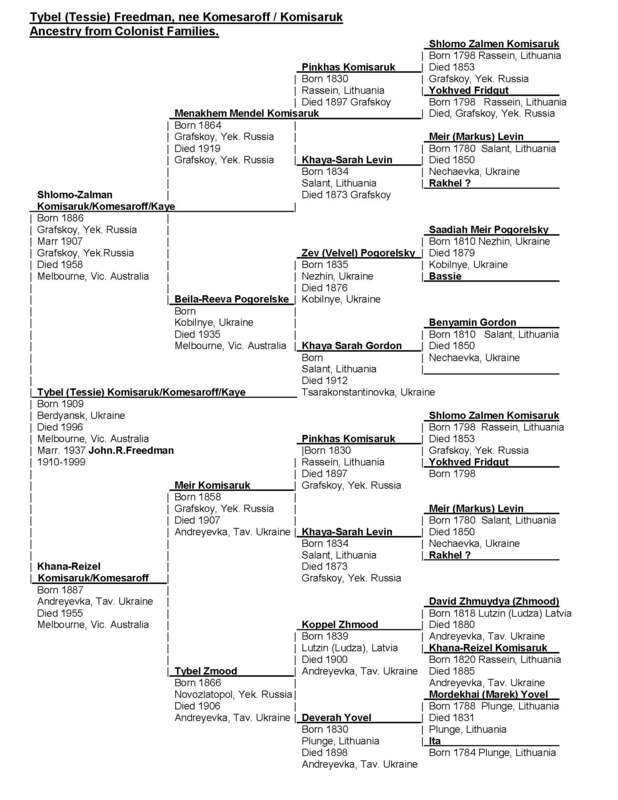 Ukrainian pogroms page completely rewritten. 8 Aug 2005. Colonists who moved from Vitebsk Gubernia to Novozlatopol (1850-1852). All pages scanned. 1 June 2005. Holocaust page completely updated. 4 May 2005. On the Photography/ Places page - 2 pictures from Yad VaShem valley of communities. Angeles, with thepermission of the editor Nancy Holden. 9 May 2005. Mass grave in Trudolyubovka. 1919. 5 May 2005.Report about trip to city of Ekaterinoslav and colonies of Guliaipole district in the period November 24 – December 3 1924. Obtained by Mel Comisarow, translated by Joseph Komissarouk. 5 May 2005. Holocaust victims, killed in Novozlatopol and region. 5 May 2005.Archival records page was updated. 5 May 2005. A link to Efingar colony page in russian was added to the kehilallinks Efingar page. Voters lists: Shultz andBeizitzer election for Ekaterinoslav Gub. colonies (1861-1869), including partially translation. Grafskoy colony census (1858) - original document and translated surnames list. Remember to check the Yad Vashem database. The Central database of the Shoah victims' names. There are many people who came from our colonies and towns. Search by surname and by town name. In order to create a on-line database with colonists names we need volunteers who can translate documents, such as census, metrical books, shultz election lists etc. Write us if you have appropriate skills (Russian, Hebrew) and the time! All photographs on this site may be copied only with the permission of the original owner. All rights reserved on original research articles. For reproduction, please contact Nancy Holden.